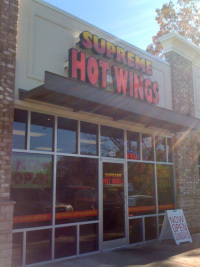 WELCOME TO SUPREME HOT WINGS! Here at Supreme Hot Wings delicious food, a pleasant atmosphere, and great customer service are top priorities. Whether you decide to dine-in or enjoy your food on the go, we're sure that your first visit won't be your last!